U.S. women are largely unaware of uterine fibroid embolization (UFE), a minimally invasive treatment for uterine fibroids that is less painful, preserves the uterus and allows women to get back to their lives sooner than surgical options, according to results from a new nationwide poll released today by the Society of Interventional Radiology. The data included in the report, The fibroid fix: What women need to know, show that 44 percent of women diagnosed with uterine fibroids say they have never heard of the less invasive treatment option. The online survey was conducted by Harris Poll on behalf of the Society of Interventional Radiology in June 2017 among 1,176 U.S. women ages 18+ to better understand awareness of uterine fibroids and women’s knowledge of fibroid treatment options. These results uncover a lack of knowledge that suggests women with fibroids are not being informed by their physicians about all treatment options for this condition, which affects the majority of U.S. women. The survey found a majority of women diagnosed with uterine fibroids note that having their doctor discuss all options with them is the most important factor for selecting a treatment. However, 46 percent of women diagnosed with uterine fibroids who have heard of UFE did not first learn about the treatment from their OB-GYN. “Misperceptions about uterine fibroids and the treatments available often lead women to undergo invasive and potentially unnecessary surgery for their fibroids, despite more than 20 years of clinical use supporting uterine fibroid embolization,” said James Spies, MD, MPH, FSIR, a professor of radiology at Georgetown University Medical Center in Washington and an adviser for the report. Spies, a past-president of the Society of Interventional Radiology, is an internationally recognized expert on UFE who has made valuable contributions to primary and clinical research assessing outcomes related to various fibroid therapies. “It is a disservice to women to not provide all the information needed for an informed decision,” he said. UFE is a minimally invasive, image-guided, non-surgical treatment that is less painful and has a shorter recovery period than surgical options. The treatment is often just as effective as other uterine fibroid treatments. More than half of U.S. women (57 percent) do not think they are at risk of developing uterine fibroids. A majority of women (62 percent) have never heard of UFE, with 44 percent of women diagnosed with uterine fibroids reporting that they have never heard of the treatment. Among women who have heard of UFE, the majority (73 percent) did not first learn of it from their OB-GYN, the frontline provider of fibroid treatment. These women first learned about the treatment from other sources, including friends or family (32 percent), their own research (9 percent) or, particularly for younger women, from advertising (23 percent for all women 18+ and 38 percent for women 18-34). One-fifth of women (20 percent) think hysterectomy is the only treatment for fibroids, and, of those diagnosed with fibroids, 11 percent still think hysterectomy is the only treatment option. UFE is performed by an interventional radiologist who inserts a thin catheter into an artery at the groin or wrist. The doctor guides the catheter to the fibroid’s blood supply where small particles, about the size of grains of sand, are released to block the blood vessels feeding the fibroid, depriving it of nutrients. As a result, the fibroid shrinks and dies. After treatment, women should be back to their normal activity in about one week and should follow up with their interventional radiologist and their gynecologist a few weeks after that. 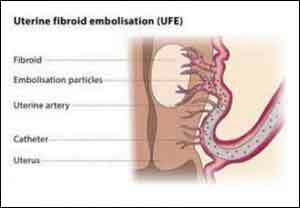 Approximately nine out of 10 patients who undergo uterine fibroid embolization experience significant improvement, with many reporting their symptoms disappear completely.